On 12th November 1611 a 16-year-old was crowned King of Sweden. 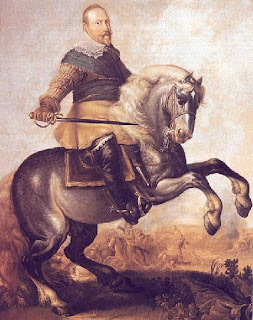 This was Gustavus Adolphus, who did a huge amount to reform his country and, as a military general, was instrumental in saving the Protestant movement in Europe during the Thirty Years War. He succeeded the tyrannical King Charles IX who, at his death, had left Sweden fighting three simultaneous wars. Gustavus settled these quickly, learning some of the arts of war in the process, before concentrating on domestic matters. He persuaded the nobility of Sweden to forego some of their ancient privileges for the good of the country, and also introduced a modern education system that allowed talented people to rise to the top. The government of Sweden became one of the most efficient in Europe. The Thirty Years War broke out in 1618 as an attempt by the Holy Roman Empire (a loose confederation of central European states) to turn back the tide of Protestantism in Europe. Gustavus Adolphus stayed on the sidelines until 1630, but his intervention was decisive. He advanced rapidly through northern Germany and won a convincing victory at the Battle of Breitenfeld (near Leipzig) in September 1631. The Swedes then rampaged through southern Germany, capturing the cities of Munich, Nuremberg and Augsburg. The Swedes had another major victory at Lützen, also near Leipzig, on 16th November 1632, but Gustavus Adolphus was killed while leading a cavalry charge during an early phase of the battle. His death was a setback for the Protestant cause and was a major reason why the war was to drag on for another 16 years.